The Victor Midnight Black Collection brings a fresh perspective to desk accessories by offering functional solutions with appealing design elements. 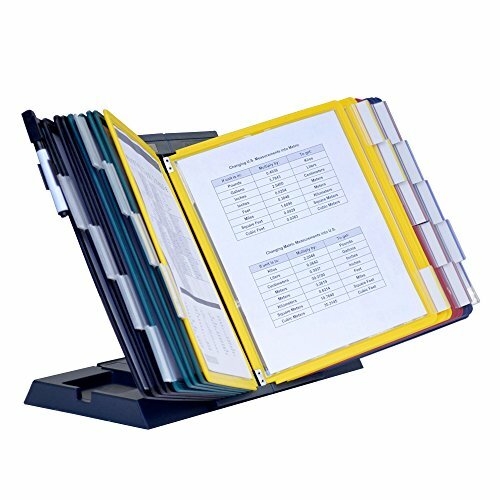 The 5500-5 Tidy Tower provides a vertical design that makes the most out of limited space by combining large letter tray, open shelf and drawers for supplies. 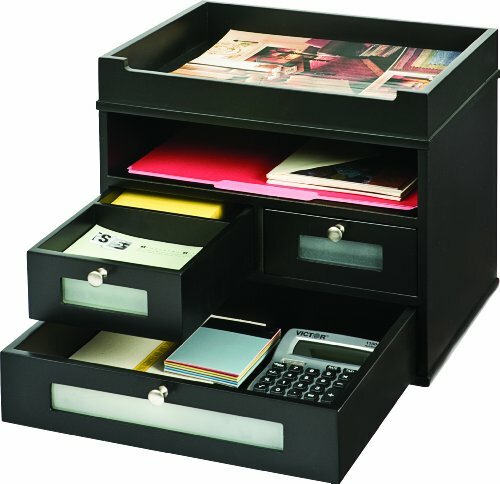 A divider inside one of the small drawers allows for storing smaller items. Features sturdy 11.3 lb. wood construction with a durable double coated matte black finish. Brushed metal handles, faux leather top and frosted glass windows add a touch of class. Non-slip rubber feet reduce movement and protect your work surface from scratches and scuffs. 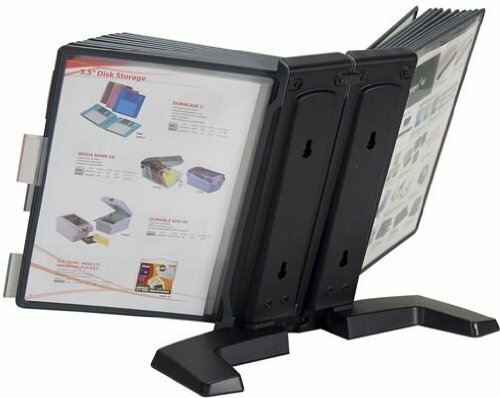 Compact 12.3" x 10.8" x 10.75" design with crown molding base makes a great addition to any desk. Perfect for use either at home or in the office. Keeps reference materials accessible. Rack features adjustable viewing height and angle. 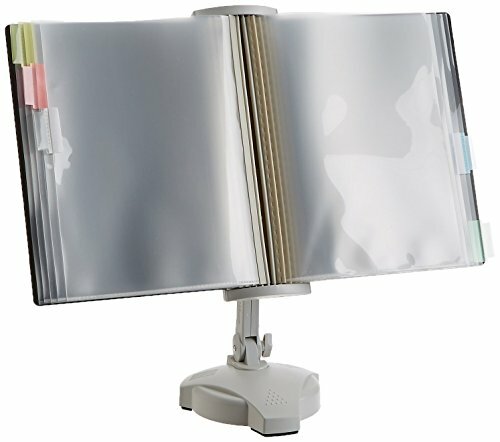 Ten clear plastic pockets hold up to 20 documents. Weighted base keeps reference rack stable while in use. Unit can be wallmounted to save space (hardware not included). Includes index tabs. 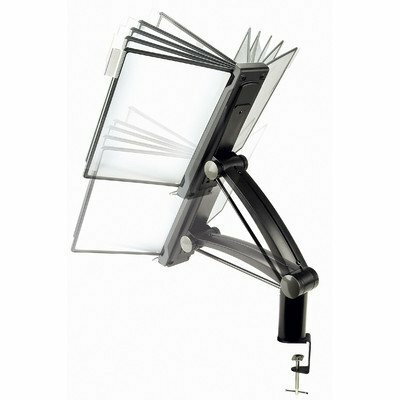 FDS005L Features: -Includes 10 adjustable index tabs. 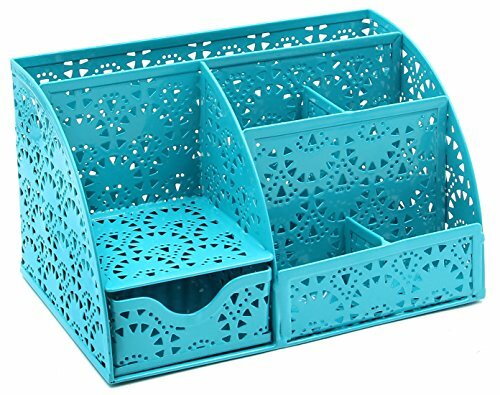 -Desktop organizer. -Tilts: 25°. -Displays 20 pages of documents. 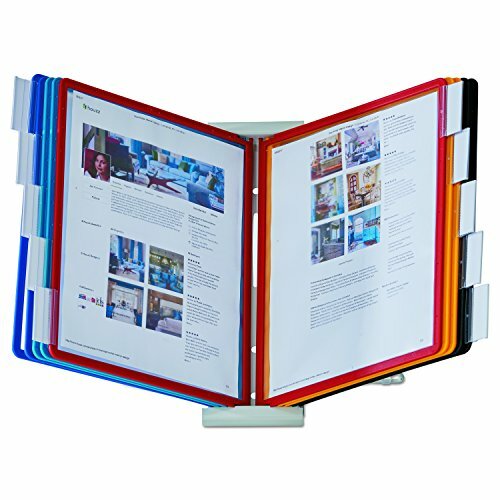 -Comes with 10 letter size and clear pocket document holders. Product Type: -Copy Holders. Color: -Black. Dimensions: Overall Height - Top to Bottom: -11.5". Overall Width - Side to Side: -13.5". Overall Depth - Front to Back: -19". Overall Product Weight: -6.5 lbs. 20-Pockets hold 40 documents. Find information fast by putting frequently reference information at your fingertips. 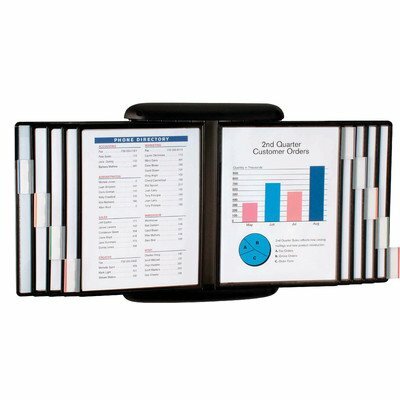 Arrange schedules and other must-use documents in display pockets for easy viewing. Keep things like post-its, writing instruments and business cards close at hand in the partitioned base. 10-Pockets hold 20 documents. Find information fast by putting frequently reference information at your fingertips. 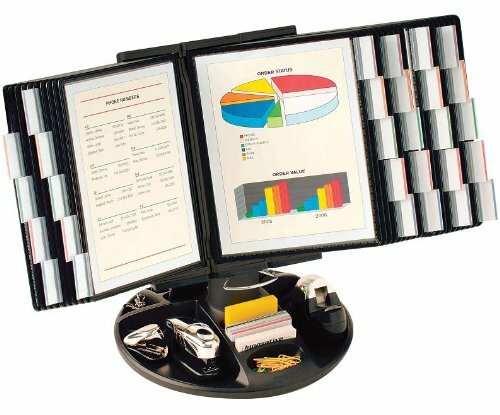 Arrange schedules and other must-use documents in display pockets for easy viewing. Keep things like post-its, writing instruments and business cards close at hand in the partitioned base. FDS022L Features: -Organizer. -10 letter size pockets with index tabs. -Holds up to 20 letter sized pages of information. -Magnetic back. Product Type: -Copy Holders. Color: -Black. Material: -Plastic. Dimensions: Overall Height - Top to Bottom: -12". Overall Width - Side to Side: -13.5". Overall Depth - Front to Back: -19". Overall Product Weight: -3 lbs. 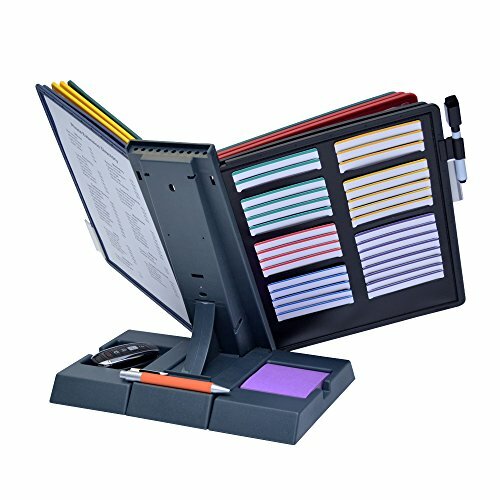 Copyright © Wholesalion.com 2019 - The Best Prices On Desktop Reference Organizers Online.